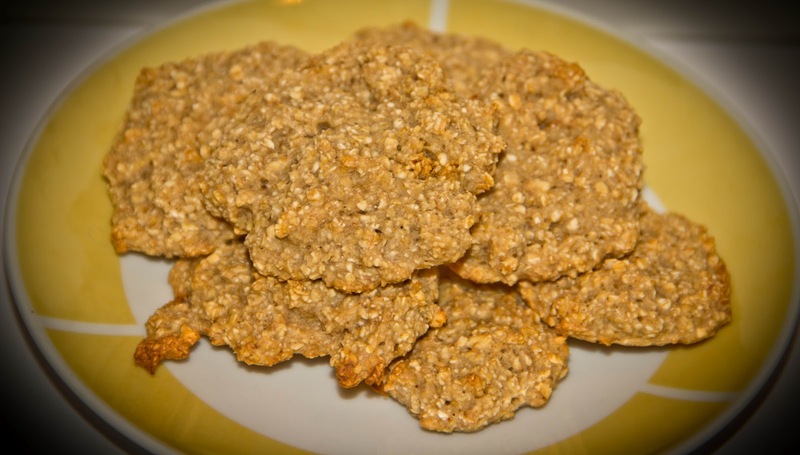 I have searched the Internet and combined several different healthy cookie recipes into the following one, according to what I had in my cupboard and how I wanted it to taste. 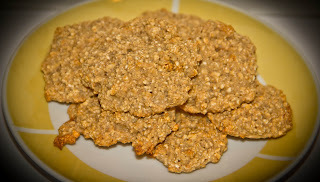 This recipe is super easy and healthy, and the most important thing is that these cookies are soooo delicious. Mix oats, sugar and baking powder in a small bowl. Add the chopped banana and blend the mixture with the food processor. (I like the oats to have the flour consistency, that's why I blend it all together. But you could skip this and just mash the banana before adding it to the rest of the ingredients.) Add milk and mix it well until you get a sticky consistency. Place the mixture with a spoon on cookie sheet and bake it in the oven for 20 - 25 minutes on 180 degrees Celsius (360 Fahrenheit). This mixture will make about 6-8 cookies, depending on their size and I would say each cookie has no more than 30 calories! They are a great on-the-go snack since they are really filling and satisfy the sweet-tooth. And they are also super healthy and nutritious. You can alter this recipe the way you'd like, by adding cocoa or chocolate chips to it. ahh these look really good! !